What, in broad terms, is the Marxist view. What, in broad terms, is Piketty’s view. How #1 differs from #2. That will be our structure. Alienation–workers in the capitalist system are alienated in four ways. They are alienated from the product of their labor insofar as the product’s design is determined by what the capitalist wants, not the laborer. They are alienated from the work itself insofar as the division of labor causes them to participate only in one small part of the productive process rather than see a product through from start to finish. They are alienated from themselves insofar as they do not have the opportunity to do a variety of kinds of work and have limited opportunities to exercise their creative natures. They are alienated from other workers insofar as they are made to compete with one another for jobs and income and are played off against each other by the capitalist. Exploitation–workers in the capitalist system do not receive the full value of their labor because the capitalist keeps part of that value as profit. Revolutionary Marxism–in the classical form espoused by Marx, capitalism can only be ended by a violent revolution in which the workers seize the means of the production, i.e. they take from the capitalists the factories, land, resources, tools, and so on and own them collectively. Reformist Marxism–in the form espoused by the Fabians in Britain and by the old left more generally throughout Europe (much of which is no longer a serious political force even on that continent), capitalism is ended gradually through the democratic system via the gradual seizure of assets and nationalization of industries by a socialist party which maintains its mandate by winning elections. Many Marxists also subscribe to Marx’s belief in dialectical materialism, his “theory of history”. Marx believed that capitalism contained inherent contradictions that would reduce the workers to misery and compel them to overthrow the capitalist system. Many Neo-Marxists have made it their enterprise to figure out why this has not happened, often appealing to a cultural critique that alleges that the capitalist system uses hegemonic ideas and liberal reforms to keep itself palatable to the workers. The Rate of Return to Capital (R)–the rate at which existing wealth grows. 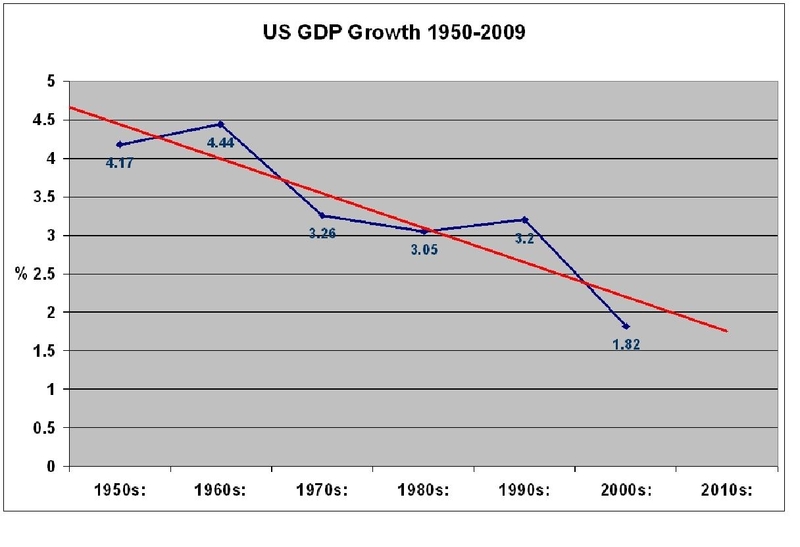 The Rate of Economic Growth (G)–the rate at which the economy generates new wealth. If R > G, wealthy citizens will see their assets grow in size faster than the economy grows. They will become proportionally wealthier over time regardless of the amount of work they do or the extent to which they contribute to society. In this kind of society, once a family becomes wealthy, it gets wealthier in perpetuity provided that no member of the family actively squanders the fortune. If G > R, wealthy citizens will see economic growth outpace the rate at which their assets grow. While they will still gain wealth in absolute terms, in relative terms their wealth will slowly become a smaller piece of the economic pie. In order to maintain their status over extended periods, they and/or their children will have to find and develop additional sources of income. In this kind of society, a family must continue to contribute to society in order to maintain its relative prominence. 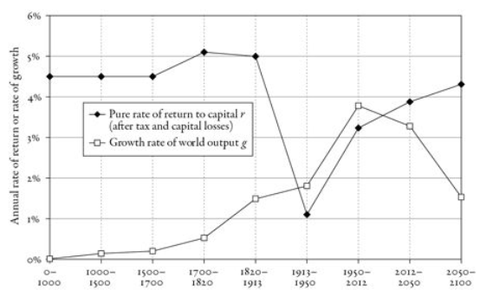 In sum, Piketty is anticipating a return to the pre-20th century trend, in which growth rates are much slower and the rate of return to capital is much higher than was the case in much of the 1900’s. It’s not my task today to assess the empirical research behind this claim–Piketty uses almost 500 pages to defend it, and I don’t have that kind of verbage to spend here. The point is that this is a very different kind of argument from the Marxist argument. Marxists were wholly dissatisfied with the economic system even during the post-war period in which growth rates were quite high and inequality comparatively quite low. Piketty is a Keynesian liberal rather than a Marxist; his goal is to return us to the 20th century economic conditions under which we saw rapid growth with disbursed benefits. Piketty’s policy solution is for states to collude on their tax rates so as to make it impossible for businesses and rich people to use capital flight to avoid higher rates. This would depress the rate of return to capital. Presumably, Piketty believes those funds could be redistributed to consumers for the purpose of consumption, disbursing the benefits of growth and stimulating the growth rate. R falls and G rises, so as to ensure that G continues to be greater than R.
This is a nuanced argument for taking meaningful action to structure our economy more similarly to the economy into which the baby boomers were born. In the United States, Marxism is rightly or wrongly looked upon as frivolous and naïve. This is neither. Piketty’s proposed solutions are not politically feasible in no small part because of the right’s ability to associate in the mind of the general public these kinds of arguments with Marxism. It is a slanderous, dismissive comparison and a straw man argument. The claim that our society should disburse benefits moderately more equally is not equivalent to the claim that we should live in a perfectly equal Marxist utopia. Those that argue as much either do not understand what these left wing positions are or are failing to participate in the debate in an honest and forthright way. You may be interested in my blog King Solomon’s Wisdom for the GOP as an added perspective to your post. thank you Benjamin for a clear and concise comment on Piketty and equality. I particularly like your piece on. Stieglitz and krugman regarding inequality and underconsumption where you make a call for stieglitz. I believe you have a great career in academia with such clear and succicient writing. Regarding Karl Marx and nationalisation of means of production, I also believe you are wrong. Karl Marx called for the workers to own their own means of production, not the state. As such nationalisation was not what he was aiming for. In discussion regarding this, Karl Marx said in Paris he was not a communist. In all his work Karl Marx was very unclear about his solutions. However, he was very meticulous when it came to the analysis of capitalism and its inner logic. Some parts of may be very relevant and correct. Other aspects, such as labor theory of value seem more dubious. Is it possible to agree with some of the analysis of Marx without agreeing about solutions about nationalisation and dictatorship. I think it is possible for two reasons. First, Karl Marx not propose all the solutions that you suggest in your post. Secondly, there are many alternatives to either state or worker ownership of means of production. Keynes suggested that we increase public spending to compensate for reduction in private consumption. In the Nordics we have strengthened the institutional powers of workers (people who receive a salary) to ensure that the workers maintain their share of the pie as productivity grows ( and as such avoids/reduces the problems of underconsumption) However, as you write in your blog about Krugman/ Stieglitz, sustaining or increasing consumption by lending the money to workers just is not sustainable. So yes, Piketty may agree with much of Marx analysis (just as Keynes and schumpeter) without proposing a soviet style communism (which I believe not even Karl Marx would agree with) Does that make him a Marxist? I do not know. Maybe for the sake of maintaining somewhat of rational discussion maybe the best thing would be to say he is not. If he was to say he is a Marxist that may cloud the discussion because so many misconseptions, stereotyping and fearmongering is tied to him. In this piece I make a distinction between revolutionary Marxism and reformist Marxism. Marx himself presented the original revolutionary Marxism, but the movement Marx founded has since grown and fragmented. In the revolutionary camp, there are now Leninists, Trotskyites, Stalinists, Maoists, and so on. In the reformist camp there are the Fabians, democratic socialists, and so on. If we only categorized as “Marxist” those who hold the views of Karl Marx himself, we would ignore the many forms of Marxism that have arisen post-Marx. In Capital in the Twenty-First Century, Piketty does not argue either for a revolution or for the Fabian project, but instead proposes a global wealth tax. Piketty claims that the causes of inequality are not intrinsic to capitalism–he argues that sound government policy can yield a more sustainable capitalist model. This is much closer to the Keynesian capitalist position (that capitalism can be made sound through state policy) than the Marxist one (that capitalism is intrinsically and unavoidably fated to collapse). Your argument seems to hold that Keynesians are Marxists, and here I would differ with you–while Keynesians agree with Marxists that unregulated capitalism has problematic tendencies, Keynesians believe that capitalism can and should be regulated by the state rather than replaced with something else. All Marxists, whether revolutionary or reformist, are necessarily committed to eventually doing away with capitalism altogether.